Enjoy a plush and cozy space in your home when you shop with us at one of the top carpet stores in Houston, TX. Flaherty’s Flooring America offers a full selection of product options for rooms of any size. Whether you are looking to upgrade your bedroom or living room, you will find something you love when you visit our showroom. Browse our collection of carpet flooring to learn more about your options for every room. When you are looking to add comfort and style to your home, nothing beats the look and feel of carpet flooring. New carpet installation delivers an instant upgrade to your home. 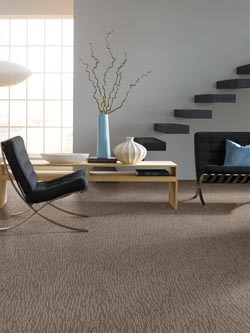 To achieve your style goals, shop for your products from one of the area’s leading carpet stores. At our local showroom, you will enjoy access to a variety of products that make it easy to enhance your space. Carpet delivers cushioning, noise reduction, and insulation in rooms of any size. This material is easy to care for, requiring only a simple vacuuming to keep it looking beautiful throughout the years. Visit our showroom today to discover your options in Berber carpet and other products. Our team is happy to speak with you to discuss the features and benefits of our materials. With us on your side, you will make the right choice for your carpet installation. Once you choose the right flooring for your home, trust our team to complete the remodel for you. The staff at our flooring store is fully equipped to provide carpet installation services for rooms of any size. No matter which type of material you select for your home, you can count on us to deliver the top service. We ensure that every inch of flooring is laid down properly, preventing dips and other issues. With our services, you can rest easy knowing your new carpeting will look its best from day one. Berber, one of the most popular options in carpeting on the market today, delivers a unique blend of comfort and beauty to homeowners everywhere. This stunning flooring is available in a range of designs and color options. From dens to entryways, every part of a residence will stand out for the right reasons when it is fitted with Berber carpet. Contact us at (281) 297-8144 to shop with our team for your carpeting. We proudly offer a variety of products and services throughout the Northwest Houston area.